Congratulate yourself. You are here, in the wasteland of week two, when so many others have fallen. You’ve watched the NaNo hashtag sliding up and down the trending ranks on twitter, like a lift between floors. 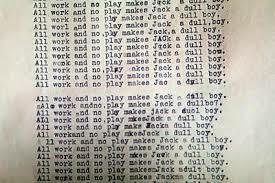 You’ve clicked on the hashtag, smug with your word count; discovered that everyone in the universe has actually written more than you; written 900 words in a Chardonnay-infused haze to catch up (although secretly thinking they’ve all gone Jack Nicholson in The Shining: All work and no play, etc, or else are lying). Click onto your Scrivener file; read the 900 booze-infused words; have a cry. Or some tea. Or some wine. Or some heroin. Compose lighthearted tweets about willies. Replenish your wine glass. Watch the last Doctor Who on catch-up. Wonder if you’re alone in sort of, a little bit, fancying Peter Capaldi. Converse with a writer on twitter, committing yourself in a public arena to writing another 1500 words by the end of the day. Feel a little bit ‘meh’ about starting this scene (which is hard, as scenes go: strong emotions, etc)… but, joints nicely oiled by el vino, you find it much easier than you thought it would be. 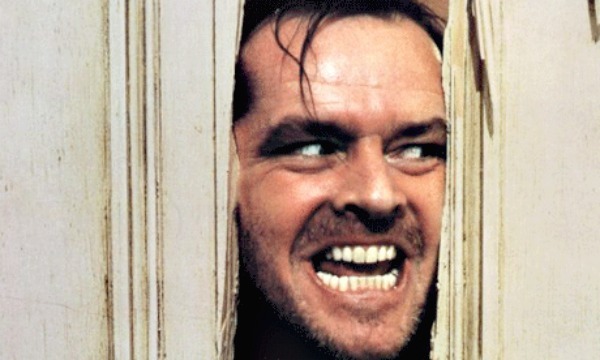 In fact (let’s not mince words) you’re writing like a fiend, or a demon, or Jack Nicholson in The Shining, and even if Jack Nicholson came raging towards you –Here’s Joohhnnnyyy! – with a pick-axe in his hand you would probably not even notice. That’s how in The Zone you are. Nothing can get you when you’re in The Zone. Not even a pick-axe. Decide not to actually read what you’ve written (whilst feeling The Flow, In the Zone). Post your own word count to twitter, thus causing a never-ending ripple through the food-chain of writers: those who have written less than you will now (a) feel insecure (b) chug wine (c) write furiously to catch up (d) post their own word counts to twitter, etc, etc, ad infinitum, because everyone knows The Writer is a curious beast who feeds mainly on jealousy and the failure of others. Realise you’re still in your PJs. Realise you smell. Stagger into the shower and ruminate on the brain’s need for a SAVE button, as every plot point, weak character, crappy sentence you’ve ever concocted instantly resolves itself the second you step away from your laptop and have no real way of recording anything (unless you have bath crayons). Kid yourself you’ll write a little more before you fall asleep. Dream well. Dream big. Dream something you can use in your novel. Dream that your novel is wielding a pick-axe.